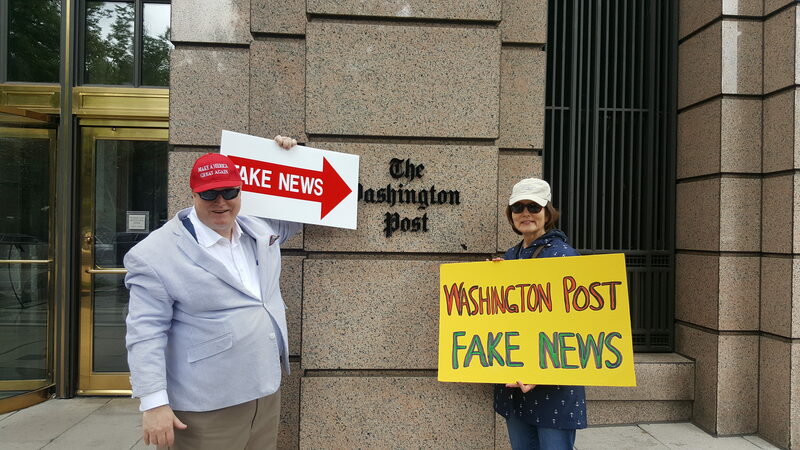 Ronald Wilcox, Executive Director of Secure America Alliance, poses in front of the Washington Post with one of his fellow protesters (Cathy). 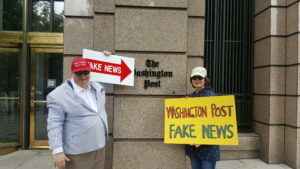 Supporters of President Donald Trump singled out the Washington Post as the biggest example of the lying “fake news” media with a street demonstration in front of their Washington DC office on June 7, led by the Executive Director of the Secure America Alliance. The Washington Post counter attacked by sending out one of their employees to harass and belittle the pro-Trump street protestors. The Washington Post and other fake news media outlets have engaged in a continuous and partisan campaign to smear President Trump and to destroy his ability to govern. They have relied on leaks of classified and secret information from their “deep state” sources within the government, unnamed sources, innuendo and downright lies and fake or false information masquerading as news reports. Other organizations which participated in the protest are Main Street Patriots and Americans for the Trump Agenda. Two more pro-Trump, anti-Fake News events are planned in the future, one at CNN in Atlanta, GA, the other at the New York Times. The CNN protest is planned for this Saturday, June 17, with the full support of Secure America Alliance and led by Debbie Dooley of Main Street Patriots. “We’re encouraging people to come out and support our president,” said Dooley, one of 22 national co-founders of the Tea Party and co-founder of Main Street Patriots. “And to condemn the extreme biased coverage at CNN” (Breitbart News). Secure America Alliance fully endorses the statement explaining the protest this Saturday at CNN. The Secure America Alliance endorsed protest will take place from 11 a.m. to 12:30 p.m. Saturday at CNN, located at 190 Marietta St. NW, Atlanta, Georgia. The ability of Secure America Alliance to continue to play a major leadership role in the movement to defend the winner of the 2016 election, President Donald Trump, and counter attack the lying, false news media, relies on the degree of support we are able to muster. To help follow the link to “opt-in” to our free e-newsletter list or even better use the “donate” button on the top page of this website.